At the time, you thought it was a great idea to buy that quesadilla maker. But when a close friend pointed out that cooking a quesadilla in a pan is far easier, faster and with less clean-up, it was then you realized it was just another useless kitchen gadget. We get it, what home cook doesn’t love the idea of owning miracle tools that make food preparation easier and more fun? It’s just a shame that so many kitchen gadgets on the market today are utterly useless. Not only do these gadgets waste money, they take up precious space and put your family to shame. That is not to say every cool gadget you see on Amazon is useless or a waste of money, but perhaps you should think about what you are buying before clicking the pay button. 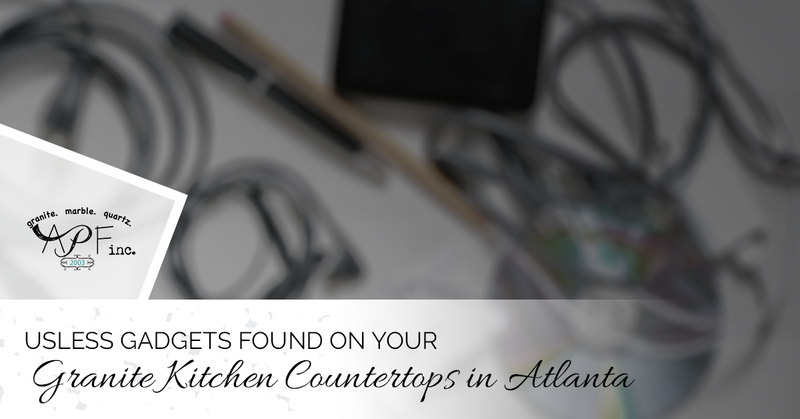 A Polished Finish, your source for granite kitchen countertops in Atlanta, offers you this fun list of useless kitchen gadgets we hope not to see in your kitchen. If you have an extreme phobia of touching pickle juice, the pickle fork is for you. Of course, any fork can be used to pluck a dill sphere from its jar, the only difference is the fancy name: Pickle fork. If you have no fear of pickle juice, just stick your fingers in their and grab a pickle. The only reason anybody would want to own a pickle fork is to tell others they own a pickle fork. Pickle fork. Can you believe there is a dedicated instrument that you can use to see if the cake you are baking is done? The cake tester looks pretty much like a toothpick with a handle. The question is how many toothpicks could you buy with the money you spent on such a useless gadget? If you are baffled by how much pasta to cook, the pasta portioner is here to save the day. Whether you are serving spaghetti for two or fettuccine Alfredo for a party of six, the pasta portioner will eliminate that pesky guesswork and show you just how much pasta to make. While we agree that fungi could use a little tidying up before being sliced and sauteed in garlic and butter, we don’t think they need their own grooming kit. A damp paper towel works just as well. We are out of time for now, but check back and we will bring you useless kitchen gadgets part two. In the meantime, give A Polished Finished a call if you are considering a kitchen remodel.